In light of the recent news that head brewer Chris Miller is departing Snipes Mountain Brewing Company to be a part of a new brewery startup in California (Visit WA Beer Blog for full story), below is a Mugshots profile I did on Chris from a year or two ago. He’s a hell of a nice guy, a great brewer, and someone who will be missed by many. Cheers, Chris. Best of luck in your new adventure. In Washington, where a large percentage of the world’s hops supply is grown in the Yakima Valley, breweries have long been known to take advantage of their proximity and are well-known for brewing up good, hoppy beers. Chris Miller is lucky enough to brew smack dab in the middle of hop country. He probably wakes up some mornings and can’t help but smell the aroma of Cascades (the hops, not the mountains!) as he heads out his door to work as Head Brewer of Snipes Mountain Brewing, located in Sunnyside, WA in the Yakima Valley. With this advantage of location, you shouldn’t be surprised that Chris has learned a little something about brewing and how to use hops to his advantage. The Snipes Harvest Ale recently won 1st place at the Yakima Fresh Hop Ale Festival, where Chris competed with other NW brewers in crafting a “fresh hop” beer. On top of that, Chris was recently in Denver to accept a Bronze Medal at the Great American Beer Festival for his Coyote Moon, which is a British Mild with a low 3.9% alcohol by volume. Chris hasn’t really been brewing for very long (when compared to many in the industry), which makes his accomplishments that much more impressive. 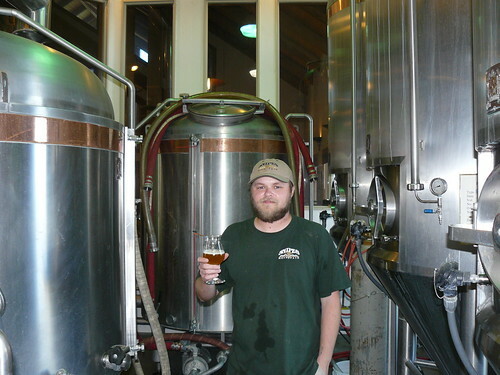 Chris’ first foray into the beer industry was at Pacific Rim Brewing in Seattle, WA. He started out as a frequent customer at the brewery’s tap room, and eventually he took a part-time position helping out in the brewery and washing kegs. Chris became good friends with Pacific Rim Head Brewer Scott Barron, from whom he learned much of the brewing skills that he uses today. According to Chris, “Scott taught me my brewery work ethic. We worked really hard and there was a lot that went in to brewing on Pacific Rim’s system. We were maxed out on production, and things were just crazy around there. It helped prepare me for just about anything that’s come up here at Snipes.” As time went on at Pacific Rim, the brewery began to struggle financially, and it started to show in the resources available for Chris to brew with. “We were having to tweak recipes that used multiple grains and hops and just try to make them work with what we had on-hand. It was a tough situation, but I learned a lot out of it (regarding ingredients and recipe development).” He continued brewing at Pacific Rim for a total of almost four years, and when the brewery shut down he was left looking for work. Although he grew up and was still living in Seattle, Chris knew a good opportunity when he saw one and accepted the Head Brewer position at Snipes when it was offered to him in January of 2008. Chris inherited an already successful brewing operation, but he has brought Snipes’ beers to another level since taking over. He tweaked many of the base recipes of the brewery’s standard lineup, and he has put his mark on the lineup by brewing regular seasonals and special releases. The brewery’s owners give Chris full control over the brewery operations, and as long as his beer sells he can pretty much brew whatever he wants. Coyote Moon is one of the beers that Chris inherited and tweaked into its current GABF medal-winning recipe. “When I took over, Coyote Moon was a 5.5% or 6% ABV beer that was good in its own right, but I wanted to lower the ABV to make it more sessionable (It’s now 3.9%). It makes for an absolutely fantastic cask beer. It’s one of my favorites.” One unique thing about Chris’ beer is that they are all brewed with the same strain of house yeast that can be used for both ales and lagers. He has tried experimenting with other yeast strains, but he always comes back to his house strain. Chris is also starting to experiment more with barrel-aged beers and sour beers. Using “wet” fresh hops that are pulled straight from the vine during harvest season without drying is something that Chris has begun to perfect over the past two years. “It’s really tough to get the flavors and bitterness right when using fresh hops, but the greenness of these hops can add so much to beer that you can’t get from dried hops.” His first place win at the Yakima Fresh Hop Festival this year is evidence that he’s got fresh hops figured out pretty well. As for the future, Chris is a pretty happy man right now. “I’m doing what I’m doing right now and I really don’t think about the future too much. Things are working out for me here and it’s just lots of fun. Now the brewery is kind of like a kid, and I’m not sure I’d ever want to leave it.” As long as he keeps making great beer in the middle of hop country, I’m sure Washington beer drinkers will be happy to have Chris around. I received your information from Gwenn who met you at a dinner last week. She had mentioned you may be interested in doing an October beer dinner with us. My number is 408 921 1266- Would love to discuss with you- email would be ok too.